Genetic Alliance UK Annual Conference and Annual General Meeting will be held on 25 September. This conference will include two keynote sessions, talks by patient organisations, our annual general meeting, workshops and a panel discussion. The two keynote sessions will focus on the implementation of genomics in the NHS and what it means for patients affected by rare and genetic conditions and the effect of living with a rare disease on patients and carers’ mental health. 10:00 – Opening from Dr Jayne Spink, Genetic Alliance UK Chief Executive. 10:15 – Professor Dame Sue Hill, Chief Scientific Officer for England, speaking on the implementation of genomics in the NHS. 10:30 – Professor Jill Clayton-Smith, Consultant Clinical Geneticist and leader of the EU network for Rare Congenital Malformations and Intellectual Disability, speaking on the implementation of genomics, how it changes the role of clinicians and their relationships with patients. 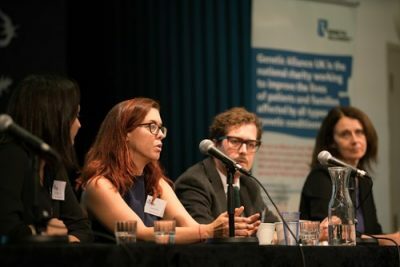 11:00 – The impact of living with rare diseases on mental health, Dr Amy Hunter and Rosa Spencer-Tansley, Genetic Alliance UK, present the findings from their research: Living with a rare condition: the effect on mental health. Followed by discussion and Q&A. 11:50 – Members’ session: current challenges and opportunities in the sector. Followed by discussion and Q&A. Do you need a patient registry? 16:20 – Panel discussion, senior management team of Genetic Alliance UK and speakers. 16:45 – Closing remarks, Dr Jayne Spink, Genetic Alliance UK Chief Executive. showcase your organisation by displaying materials and information about your work. Our AGM will be held during lunchtime, starting at 1:00 PM. To attend, please register for this event. We will be holding a vote to amend our governing documents. To ensure that we are operating a ‘one member one vote policy’ you will be asked to indicate the name of your organisation’s voting representative when registering. If you have questions that you would like us to answer, please submit them when registering. We are working to secure funds to enable volunteer-led patient organisations, patients and carers to attend our Annual Conference. Keep an eye out for our newsletters to hear more. Genetic Alliance UK registered charity numbers: 1114195 & SC039299.